It serves pigeon. And parakeet. Food trucks are great and all, but there's little they can do to surprise us these days. Even the most specialized, out-there truck probably isn't going to shock us. Or so we thought. Enter The Kitchen Of The Unwanted Animal, a food truck that serves pigeon, parakeet and "pony burgers." 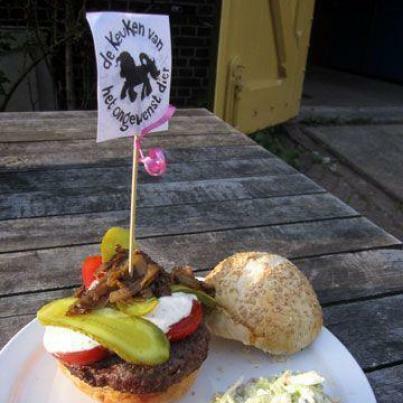 Located in Amsterdam, The Kitchen Of The Unwanted Animal began as part of an urban art project in 2011. Founders Rob Hagenouw and Nicolle Schatborn made a stew out of goose -- an animal not normally eaten in Holland, and one that has become a problematic pest in the country. Hunting laws were passed in the 1970s that protected geese. Since then, the birds' population has grown to risky heights. This can be particularly problematic for farmers and anyone flying in or out of Amsterdam Airport Schiphol. The large birds are attracted to the land surrounding the airport, which can become a safety issue. Geese can interfere with airplane traffic, landing and takeoff. A large coalition called the Netherlands Control Group for Bird Strikes (NRV) formed in 2010 to manage the risks of birds to aircrafts. According to NPR, 40,000 geese are now shot every year in Holland. When Hagenouw and Schatborn found out that these geese were being thrown away, they were inspired to put them to better use. 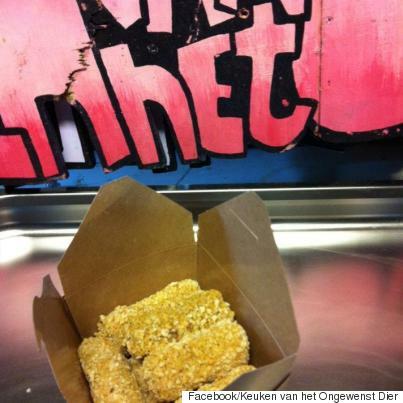 The food truck was born and the first item on the menu was Schipol Geese Croquettes. "Everyone likes it," Hagenouw told NPR. More than just a culinary adventure, the goose meat is meant to spark a conversation about food norms and waste. According to the United Nations Environment Programme, every year the world throws away about one third of all the food produced for human consumption. Note that statistic only factors in "food for human consumption." It doesn't even count perfectly edible but wasted meat from animals killed not to feed people but to protect them. We're talking, of course, about the geese in Holland. In other words, the UNEP's estimate for how much food we throw away is a conservative one. Food waste is one of the most pressing issues of our time. Chefs, food manufacturers and governments all over the world are recognizing the urgent need to combat food waste. It's becoming not only a priority, but a fashionable one at that. Dan Barber's Blue Hill restaurant has just transformed into food waste pop up called wastED for two weeks. Beloved chef April Bloomfield has long promoted the nose-to-tail ethos, and James Beard-nominated Southern chef Steven Satterfield just wrote a cookbook that celebrates using the whole vegetable. Think of The Kitchen Of The Unwanted Animal food truck as an avant-garde fashion trend. Today, the truck serves pigeon, crawfish and parakeet. It's planning to start serving fallow deer and black crow soon. Perhaps most controversially, the truck sells horse meat presented as "My Little Pony burgers." While feedback on the horse meat is predictably mixed, the truck sells about 100 of the pony burgers every day at festivals. Hagenouw told NPR, "'Ah, they have My Little Pony burgers,' little girls will say. Most of the time the girls eat the burgers; it's the mothers who don't like it." Wherever you fall on the horse meat debate, drawing attention to the problem of food waste is a concept we can all support.